It was an honour to be asked to chair the great occasion to celebrate the 25th year of the founding of ACCF. We were privileged to have the attendance of the Hon. Philip Ruddock MP (representing the then Prime Minister the Hon. Tony Abbott) and his wife Mrs Heather Ruddock, The Hon. Sen. Sam Dastyari (representing leader of the Federal Opposition the Hon. Bill Shorten), Consul General Mr Li Huaxin of the People’s Republic of China in Sydney and Mrs Li, the Hon. Gladys Berejiklian MP, the Hon. Victor Dominello MP, Dr Geoff Lee MP, the Hon. Ernest Wong MLC and Mr Bernard Lo from the Hong Kong Economic & Trade Office. It was also a great joy to see our patrons, trustees, members, our supporters and many community leaders that evening. There were over 400 guests attended the dinner. Apart from our financial stability, ACCF has become one of the key organizations in the Chinese Community, through which we are forming a valuable friendship bridge with others. In order to celebrate this important milestone in the history of ACCF, a special commemorative book was published and distributed to each guest who attended the anniversary celebration dinner. My sincere thanks to the editorial team headed by Mr Kevin Cheung in making this publication possible. A five minute video on the history of ACCF was co-produced by Mrs Monica Chu, trustee and management committee member of the Foundation and Mr Ken Wen. 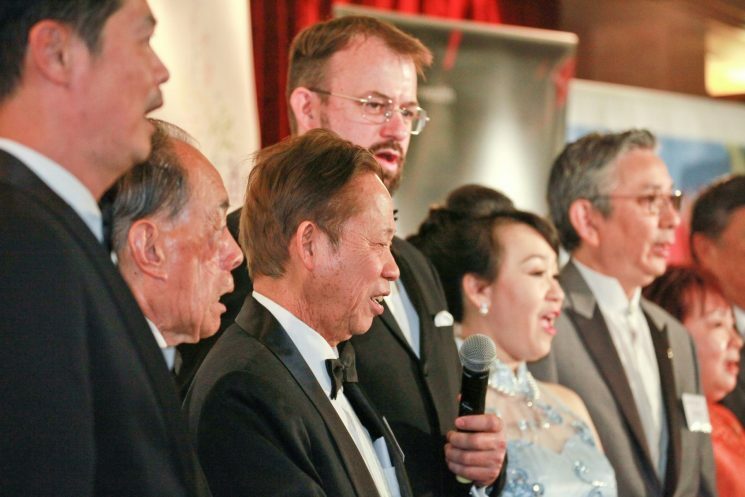 The intention was to promote the good work of ACCF to both the Chinese community and the wider Australian community. The Commemorative Book and the video can also be viewed from our website www.accfnsw.org. An ACCF gift bag filled with memorable gifts donated by our supporters and sponsors was given to each guest to commemorate this special occasion. A special raffle was organized and sold to the public prior to the dinner function. The raffle was well supported by the community as well as the friends of ACCF. On behalf of ACCF, I am very grateful for the generosity of those who donated raffle prizes and auction items. The much-needed funds raised at this anniversary dinner were used to top up the funds and grants account of the Foundation in light of low interest rates in recent years. These funds were used for annual distribution of community project funding and emergency funding for victims of accidents, illness and special needs. The great performance by Mr Edward Lee to celebrate the happy occasion was well received by his fans as well as participants at the dinner. This evening was also the presentation of cheques to successful community project funding applicants. I take this opportunity to thank the support and dedication from Dr Michael Tse and his sub-committee members for their hard work. It is only appropriate to state that I had received tremendous help from everyone. Apart from our Corporate Sponsors and many Event Sponsors, I must express my heartfelt thanks for all the Management Committee members and Event Committee members. Through this event, I see the great future in ACCF. We do have a talented team which would be the envy to many. To our distinguish guests, media representatives and our dear friends, I wish to say that taking your valuable time to attend our dinner, which often is not an easy task.